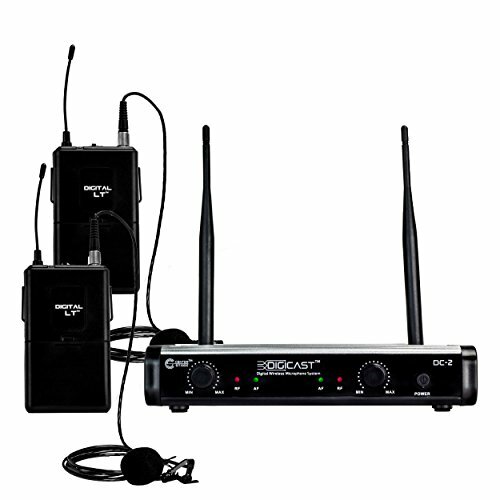 Be the center of the attention at your next gig, presentation, or karaoke session with the CenterStageTM DigiCastTM Dual Digital Wireless Lapel Microphone system. Enjoy interference-free wireless transmission, and focus on your performance, not your equipment! This system can be set up in just a couple of steps and connects to your mixer or amplifier either with the included ¼" cable (for line level operation) or with standard XLR microphone cables (not included). Easy volume adjustment from the receiver front panel and quick monitoring of the audio signal coming from the transmitters with an LED allow for flexible and simple operation. The CenterStageTM DigiCastTM wireless system delivers great sound every time! Great professional sounding microphone system. 48kHz / 24-bit digital audio format and transmission over the UHF range. A great solution for virtually any application. Singers, instructors, speakers... Anywhere you need to be heard! Rugged receiver with volume control, Two XLR mic outputs, Mixed ¼" line output, power switch, LCD display, AF LEDs (to monitor incoming audio) RF LEDs (confirms pairing with the transmitter). If you have any questions about this product by Center Stage, contact us by completing and submitting the form below. If you are looking for a specif part number, please include it with your message.